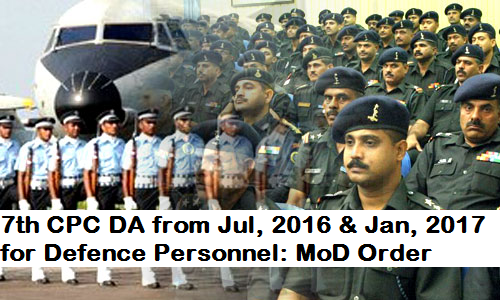 New Delhi: Government of India, Ministry of Defence has issuedd order regarding recommendations of the Seventh Central Pay Commission Decision of Government relating to grant of Dearness Allowance to Central Government employees - Rates effective from 1st July, 2016 on 18th August, 2017 to The Chief of the Army Staff, The Chief of the Air Staff,The Chief of the Naval Staff. These letters issue with the concurrence of Finance Division of this Ministry vide their Dy. No. 229-PA dated 17.08.2017 based on Ministry of Finance (Department of Expenditure) O.M. No. 1/2/2016-E.II(B) dated 04.11.2016 & O.M. No. 1/3/2017-Ell (8) dated 30.03.2017. Recommendations of the Seventh Central Pay Commission Decision of Government relating to grant of Dearness Allowance to Central Government employees - Rates effective from 1st July, 2016.